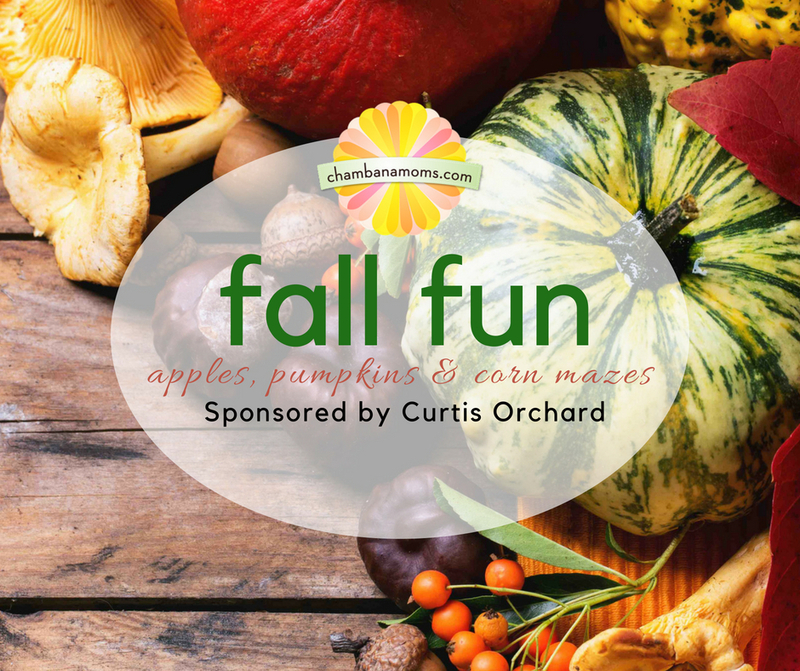 Thank you CURTIS ORCHARD & PUMPKIN PATCH for sponsoring another Champaign-Urbana Fall Fun Guide. The weekends there are always fun, but here’s an inside scoop: visiting Tuesday thru Thursday will give you a less-crowded experience than you might find on Saturday or Sunday. Also, ask them about their season pass that’s good for a year from purchase. While there, treat your taste buds with lunch at the Flying Monkey Cafe any day of the week. Then, bring your out-of-town guests here on one of those festive weekends when they continue the tradition of family-friendly live music and tons of fun activities, starting, of course, with picking your own apples & pumpkins. Mark down a visit for Columbus Day Monday too. Curtis Orchard wants you to relax this fall and come to the country! There’s plenty of fall fun to be had in East Central Illinois when it comes to pumpkins, apples and corn mazes. We’ve put all our favorite places to go in one place! If you’re looking for special events related to fall, don’t forget to check out our calendar and our upcoming Halloween guide. Looking for apple picking? Check out our Guide on Where to Pick Apples in Champaign-Urbana. The places listed below are all located within an hour’s drive of the Champaign-Urbana area. If apple picking is your favorite fall activity, this is the place to visit. On any given day a few rows are open to the general public, with a good variety of snacking and baking apples represented. The corn maze is open on weekends and is $5 per person. A host of other pay-per activities are available on the weekend, from pony rides to giant inflatables, and you-pick pumpkins are available from mid-September through October. The Country Store sells a variety of edibles such as honey and apple butter made on the property. Not to be missed: the apple cider donuts. (Best-kept secret: if your family is a frequent flier at Curtis Orchard, consider buying a season pass for the kids. Each visit, the season pass holder receives a play-all-day wristband good for two pony rides, five rounds in the Wicked Orchard Shoot-Out, and unlimited play on all other activities. Includes a complementary wristband for one free adult per visit. Passes will be honored for one calendar year at Curtis Orchard, and cost $70 for the first child, $50 for each additional child. Bonus for season pass holders: 10% off Flying Monkey Cafe combo meals, including Toto’s Lunch). There’s just nowhere else like it in the area. During the week admission is $4 for children aged 6-12, $6 for adults, $4 for seniors (kids 5 and under are free); on the weekend $9 for adults, $6 for seniors, and $6 kids 6-12. Season passes are also offered. That tells you something about how elaborate the setup is. Pumpkins, gourds and squash in every shade of the rainbow— literally; check out their pumpkin rainbow — are displayed in fanciful ways around the property. A two-acre corn maze can be toured for an additional $2 per person (on weekends). Yummy food abounds, from burgers to pumpkin ice cream — not to mention some of the most decadent baked goods fall has to offer. Open to the public Sept. 8 – Oct. 31, 9 a.m.-6 p.m. every day, seven days a week. Paintball, racing carts, hayrides, and arguably the most elaborate corn maze around are the main fall attractions at Hardy’s Reindeer Ranch. Although entrance is free, most attractions cost a fee. The corn maze is $8 for daylight hours, $9 entrance after 5 p.m. Hardy’s caters to groups, and it’s a popular spot for school field trips, Girl/Boy Scout outings, or other group events. If you’re looking for a great place to buy pumpkins but don’t feel like dealing with crowds or spending a fortune, Crowley Pumpkins in Mahomet is definitely worth a visit. The family-owned pumpkin patch offers friendly service and quality pumpkins at affordable prices. You can’t ask for more than that! Get pumpkins, gourds, etc. at this farm in the Clinton area. There’s also a corn maze, homemade treats and apple cider, animals to see (including a roaming peacock) and fresh donuts available on weekends. Farm is open daily 10 a.m. to 5 p.m. starting Sept. 3 through Oct. 30. “Each year we strive to provide our customers with the best quality and widest variety of pumpkins and gourds in Central Illinois.” Admission and Parking are free. We featured this great location in 2011 and it remains a favorite ever since. A no-frills pumpkin patch, this is the place to go when you want to decorate for fall and not break the bank. It is open through Halloween. There’s no admission charge, but there’s also not any organized entertainment. The target 2018 opening date is Sept. 22, but watch their Facebook page for updates. A festive atmosphere, with a lot of photo ops, make this a great place to make family fall memories. There are plenty of cross-generational activities including pumpkins, corn mazes, food, and even a giant jumping pillow. Rader Family Farm is open for the season from Sept. 8 until Oct. 29, 2018. They are open weekdays from 9 a.m. to 6 p.m. and weekends 10 a.m. to 6 p.m. Please see the Rader Family Farm’s website for additional information including event pricing, entrance, fee, map, online pass reservation, and special announcements. Opening for their 13th season on Thursday, September 1, 2018. The pumpkin patch will be open Sunday to Friday from Noon to 5:30 and Saturday 10 to 5:30. The final day of the season is October 31, 2018. The pumpkin patch has over 60 varieties of pumpkins and gourds, corn, Nate’s honey & apple cider donuts, straw, apples, cider, mums, barrel train, toddler maze, antique tractors, baked goods and lots of crafts. We are loaded with fall decorations and fun for the whole family. This year the Popcorn Wagon ride will take you to the popcorn field to pick your own popcorn! Free admission and U-Pick or We-pick pumpkins available. Did we miss a spot? 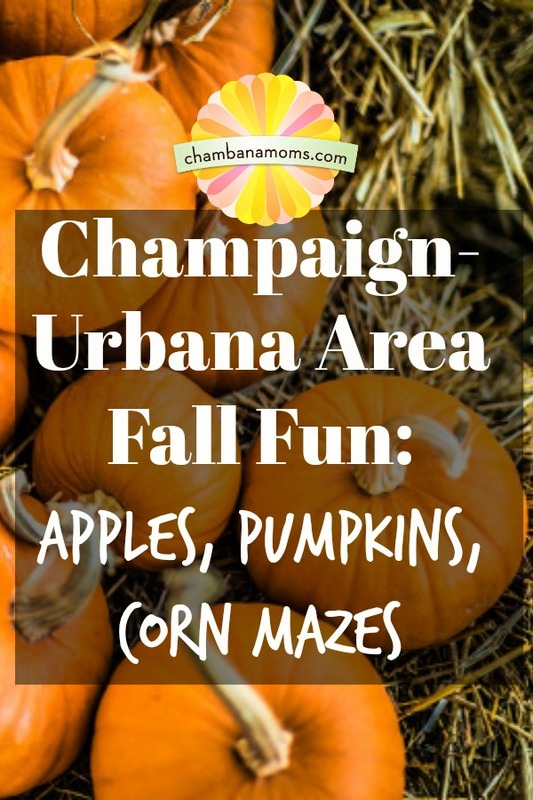 Where else do you go to get pumpkins, pick apples or run through a corn maze within an hour’s drive of the Champaign-Urbana area?